Los Angeles City Hall is located at 200 North Spring Street, Los Angeles CA 90012; phone: 213-485-2886. Photo: Aline Barnsdall Residence (Hollyhock House), ca. 1922, 4800 Hollywood Boulevard, Los Angeles, CA. The home is the main residence located on part of the original grounds of the park (an olive grove). The park was intended to be a cultural center devoted to theatrical arts. It was designed and planned by Frank Lloyd Wright. 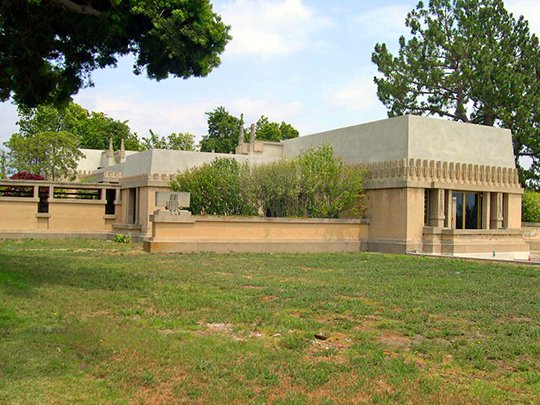 Barnsdall Park was listed on the National Register of Historic Places in 1971. Photographed by User:Sfoskett (own work), 2005, [cc-by-3.0 (creativecommons.org/licenses/by/3.0)], via Wikimedia Commons, accessed March, 2014. For one thousand years, prior to the arrival of the Europeans, much of the Los Angeles basin was home to the Tongva people, Shoshone-speaking hunters and gatherers who lived in scores of villages scattered throughout the area along the rivers and marshes and near the ocean. The Tongva, whom the Spaniards called the Gabrielenos after their association with the San Gabriel Mission, numbered between 5,000 and 10,000 when the Europeans arrived. Their village, located near the site of City Hall, was called Yangna. Archeological remains have been found at about forty locations in the Los Angeles County including sites within the City of Encino and west Los Angeles. The Tongvas' neighbors to the west, along the Malibu coast, were Chumash people. To the north, in and beyond the San Fernando Valley, lived the Tataviam people. Los Angeles entered recorded history in 1542 when the first European, a Portuguese navigator named Juan Rodriguez Cabrillo, sailing under the flag of Spain, noted in the ship's log a bay he called Bahia de Los Fumos (Bay of the Smokes), referring to the smoke from Tongva campfires. In 1603 another Spanish explorer, Sebastian Vizcaino, dubbed the inlet San Pedro, in honor of St. Peter, the second century bishop of Alexandria. (San Pedro was annexed to the City of Los Angeles in 1909.) Although the territory was claimed by Spain, it was not explored until 1769, when Gaspar de Portola, Governor of the Californias, led a Spanish land party to scout sites for Franciscan missions and civilian settlements. The Franciscan missions were established to secure title to the region for Spain through occupation, and to bring Christianity to the Native Americans. Using maps drawn by Portola and Father Juan Crespi, Mission San Gabriel Archangel was founded in 1771 by the Franciscan order. Fertile soil, benevolent climate, ample water and a large supply of Native American laborers brought prosperity to the region and led to Spanish government sponsorship of a pueblo on the banks of the Porciuncula River.On September 4, 1781, El Pueblo de la Reina de Los Angeles (the Village of the Queen of the Angels) was founded by a band of forty-four settlers. The group of Mexican Colonials, mostly miners, farmers, laborers, and artisans, were diverse in their composition. Of the twenty-three adults, eight were of Native American heritage and ten were of African descent. The pueblo flourished because the settlers recruited were skilled in trades necessary to operate the pueblo. By the end of the eighteenth century, the pueblo was more productive in grain harvests and the herding of cattle, sheep and horses than any other place in California. Land grants of fertile soil were given to retired soldiers by the governor of the Californias, and soon the colony was divided into mission, pueblo and rancho lands. In 1797, a second mission, the San Fernando Rey de Espana Mission, was established. It is the only mission structure within the boundaries of the present day City of Los Angeles. The Mexican War of Independence from Spain began in 1810. The Mexicans were victorious in 1821 and declared the Republic of Mexico in 1823. California was made a territory of the Republic in 1825. During Mexican rule, from 1825 to 1847, the rancheros became wealthy from trade in hides, tallow, wine, and brandy. Native Americans provided labor under the direction of Mexican and Californio vaqueros. The property of the missions was redistributed between 1834 and 1836, which vastly enriched the rancheros. In 1835, the Mexican congress made Los Angeles a ciudad (city). It was the largest city in California by the late 1840s. Yankee traders made contacts with the Californios during this period, drawn by low prices for cowhides and other raw materials. Some of these adventurous Americans married the daughters of the rancheros, began business enterprises, and soon became increasingly influential in the finance and commerce of the region. During the 1840s, Los Angeles became a prize of war in the Mexican-American War. On August 13, 1846, Captain John Fremont entered the pueblo and declared it an American territory. Although the Californios put up a spirited resistance, they were defeated. The Treaty of Cahuenga ended the conflict in California in 1847, but it was the Treaty of Guadalupe Hidalgo officially ended the war in 1848. The City was incorporated in 1850 with a population of just over 1600. Among that number were Mexicans of Indian, Spanish, and African ancestry; Anglos of English, French, Irish, German, and other European descent; and two Chinese. The Mexican population moved from the pueblo to areas east of the river. From 1850 to 1870, Los Angeles remained an isolated, rough-and-tumble frontier town. Economic life in those years continued to be shaped by the agriculture of the ranchos. A drought in 1862 destroyed many cattle, undermining the economic base as well as the personal security of the rancheros. A period of great prosperity began soon afterward when the discovery of gold in Northern California resulted in a flood of treasure seekers. Southland cattle, formerly prized only for their hides and tallow, suddenly were seen as a food source, and fortunes were made shipping meat to the miners. With the gradual introduction of a cash economy replacing the barter economy of the Mexican era, the rancheros were forced to mortgage their land to obtain money. By 1865, four-fifths of the ranchos were in American hands, and Los Angeles grew slowly over the next two decades. Anglo interest in Southern California and its agriculture was provoked by an exhibit in the East of irrigation-grown Southland fruit. The climate was touted by journalists as therapeutic, and invalids seeking a healthy lifestyle began to journey West. The transcontinental railroad to San Francisco was completed in 1869 by Southern Pacific Railroad, and it entered northern Los Angeles in 1876, triggering a small land boom. The San Fernando Valley became blanketed by huge fields of wheat in the mid-1870s, and for a brief period, the sheep industry flourished only to be eliminated by drought in 1876-1877. Asian immigrants arrived in Los Angeles during this era. Mostly Chinese, many worked to build the California portions of the transcontinental railroads, others as servants. Although few were landowners, their contributions to commercial Los Angeles were significant. The founder of the African-American community, Biddy Mason, arrived in Los Angeles in 1851, followed by Los Angeles' first black barber, Peter Briggs in 1852. In 1886, the Santa Fe Railroad completed its Los Angeles link of the transcontinental railroad, breaking the Southern Pacific monopoly. In the ensuing rate war, the price of a St. Louis to Los Angeles ticket dropped at one point to one dollar. The irresistible fare, huge tracts of available land, outrageous publicity, and hordes of Midwesterners eager to retire from snowy winters, combined to create a huge influx of tourists and new residents. The Santa Fe Company became a major town founder and land developer. By 1889 the boom subsided, but "Los Angeles" had become a household name. Between 1890 to 1900, major improvements were made in the city's infrastructure. A public transportation system was created, water supplies were enlarged, oil was discovered, the harbor was improved, and the City acquired Griffith Park, the nation's largest urban park. A newly formed Chamber of Commerce promoted Los Angeles and Southern California. Smaller communities outside of the original twenty-eight mile land grant were annexed to the City of Los Angeles, initiating a pattern that would ultimately increase the City's area by 200%. Los Angeles was primarily a tourist town from 1900 to 1920. Thousands came annually as visitors, and many stayed. Water was brought 250 miles from the Owens Valley via aqueduct and was used as a lure for further annexation and development of surrounding communities. By 1912, many people who were to become a permanent part of movie lore had arrived in Los Angeles. Many eastern companies had either moved to or established branches in Los Angeles. As Europe plunged into World War I, that continent's film production slowed. Audiences in the United States and abroad looked increasingly to Hollywood for entertainment. The movie industry took root in Los Angeles and flourished in the mild climate. Growth and expansion continued. By 1915, the San Fernando Valley had been annexed to the city, more than doubling its land area. The city was now predominantly Anglo, influenced both economically and socially by migrants from the Midwest. In addition to Anglo immigrants, other populations continued to grow. In 1890, there were one thousand Japanese in the city; more relocated to Southern California after the San Francisco earthquake of 1906. African-Americans began to elect political representation and create distinct neighborhoods. Because of restrictive homeowner's deeds, African-Americans were restricted from buying homes outside of Central Avenue and few other places. By 1930, the largest black community on the West Coast had formed. The Mexican-American population expanded again following the Mexican revolution of 1910, rising to over 350,000 by the 1930s. Significant Jewish immigration began in the 1920s, and they influenced Los Angeles' conversion from a rural to urban community. Cars affected life in Los Angeles in myriad and revolutionary ways. Owing to the mild climate and scenic attractions of Southern California, car touring met with instant success and by the 1920s was widely promoted. Middle-class families had access to beaches, deserts, and the mountains, often located hundreds of miles away. Domestic architecture changed to accommodate the car such that one-or two-car garages and driveways were soon all but universal. The wave of immigration between 1920 and 1940 has been characterized as the largest internal migration in the history of the United States. The automobile became the wagon of the new pioneer. The Depression did nothing to abate the flow, as unemployed workers flocked to Los Angeles looking for economic and social opportunity. Airplanes, clothing, and tires joined oil, movies, and agriculture as major Los Angeles products. A new spurt of population growth and industrial expansion during World War II continued into the 1950s. During this period the aircraft industry provided the base for the new aerospace industry. The era of freeway construction began in 1940 with the Arroyo Seco Parkway (today the Pasadena Freeway), and by the 1960s had expanded greatly as the automobile replaced the Red Car as the vehicle of mass transit. New industry enriched the economy. With these new industries and the effect of changing technology on people's lives and jobs, Modernist architecture became increasingly popular with industrial and corporate entities wishing to present an optimistic image of their companies' role in the new economy. The expansion of suburban tracts into land previously used for industrial or agricultural uses was most pronounced in the decade following the close of World War II. The development of communities in the San Fernando Valley and in the airport area were likened to the location of new and growing industrial plants. Downtown business leaders began to clamor for urban renewal after World War II. Bunker Hill, originally home to the wealthy, located to the west of the economic center of downtown, was selected as the new center for corporate Los Angeles. In the 1950s, the city initiated the Bunker Hill Redevelopment project with work beginning in earnest in 1963. All existing structures, primarily large Victorian residences, were demolished. The hill was leveled and high rise offices, apartments, the Music Center, and museums were constructed. In 1962, the Watts Rebellion lasted for six days and resulted in the looting, burning, and destruction of black and white-owned businesses in an eleven square mile area of that community. The 1970s and 1980s saw Los Angeles continue to grow and change. The end of the "Cold War" saw a cutback in defense spending, resulting in the decline of the aerospace industry. The movie industry peaked in the 1940s, but declined with the advent of television, only to become stronger than ever as domestic and international audiences continued to look to Hollywood for entertainment. Throughout Los Angeles and surrounding counties, the citrus industry and other types of agriculture gave way to residential subdivisions and new retail centers. During the 1990s, Los Angeles took steps back and forward. A recession slowed economic growth in the City at the beginning of the decade. Civil disturbances in 1992 destroyed many buildings and structures in urban neighborhoods throughout the City. The 1994 Northridge Earthquake was yet another blow to the economy, causing considerable damage to historic structures and buildings throughout the region. While the rest of the nation recovered economically in the mid-1990s, Los Angeles' economy took two additional years to recover. However, population growth continued during every year of the 1990s as immigrants from all over the world continued to join resident Anglo, African-American, Asian, Mexican, and Pacific Island populations. In addition, as the century closed, confidence in the economy as a whole and in the urban neighborhoods increased. Because of government involvement, corporate involvement, organizations, and community efforts, areas throughout the city experienced reinvestment. In many areas, buildings which were once derelict were renovated. Lots vacant for a decade, became in-fill projects, and underutilized commercial areas benefitted from catalyst projects. The attractions of climate and terrain augmented by the presence of profitable industries and a diverse population, have made Los Angeles a major metropolitan center. It has the second largest population in the United States and spreads out over the largest municipal area in the nation. It is strategically linked to Asia with its location on the Pacific Rim and has vital linkages with Canada, Europe, and Mexico. After 200 years, the vitality that fed the growth from pueblo to metropolis is undiminished. Adapted from City of Los Angeles, Office of Historic Resources, Cultural Heritage Master Plan, draft, 2007, www.preservation.lacity.org.